This Friday, April 21, 2017 Ben interviews Bendis -- and we can't wait. 3 PM can't get here fast enough, tick tock, tick tock. Not only is Brian Michael Bendis one of the hottest modern comic book creators -- he's also the ultimate fan of comic books. We hope you'll join us. If there's anything you'd like to ask him, let us know in the comments as soon as possible. You can watch online here starting at 3 PM tomorrow (or shortly thereafter). Just to whet your appetite, we're including his TEDxCLE talk for your viewing pleasure. 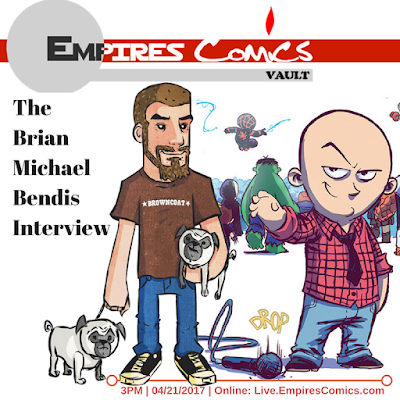 Brian Michael Bendis at TEDxCLE: "The little boxes"
Our podcast crew, Cracking the Vault's Tony Asaro, Amy Nunag, and Patrick Clarke, recently recognized the best in 2016's comics via our annual comic book awards, The Vaulty Awards. This year we added a Listener's Choice selection, so now your favorites are recognized also. Don't miss out on these awesome comics, available in a comic shop near you. Episode 90 of the podcast (listen here) announced the winners, but we've put them in print for you right here.